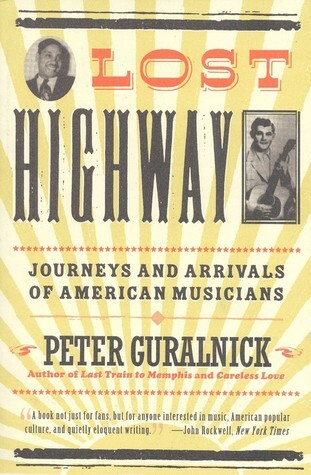 Peter Guralnick’s Lost Highway: Journeys and Arrivals of American Musicians is one of those books that can be both maddening and rewarding. His work consists of explorations of roots musicians famous, known mainly to cognoscenti, and obscure. At times one wonders why Guralnick took the time to pursue, interview and write about characters like Charlie Feathers or Sleepy LaBeef; at other times one appreciates his brilliant, incisive treatments of Charlie Rich, Hank Williams, Jr., and Elvis Presley. It’s a great book. in other words. Guralnick’s skill, if this book is any indication, is to strip away the possible and leave the probable. That may sound like double talk, but understanding artists is part inference, part voodoo. He’s really good at it, by the way. It’s a little hard to believe, but success has hemmed him in in a way that almost twenty years of of relative obscurity never did. For twenty years he played his own music, wrote and performed the songs that gained him initial attention, suffered his private miseries, but at least was engaged in his own creative struggle…. He watched his kids grow up, was supported in his bouts with self-doubt, guilt, and alcohol by family, friends, and a sense of place. Today he oversees a world that he always dreamt of, in which his importance is recognized, his music is celebrated, and he has at last achieved a measure of that success which everyone from Sam Phillips to Bob Dylan had always predicted for him. It’s the dream of almost every aspiring artist, musician, or otherwise, and yet somehow it’s all gone sour. This kind of insight pervades Lost Highway: Guralnick’s profile of Charlie Rich subtly illuminates the old adage be careful what you wish for by showing how Rich, a wide ranging musical talent who was more comfortable (and likely more gifted) in jazz and blues than in country music finally achieved great fame and monetary rewards in the music genre he found most constrictive to his talent. Guralnick gives us a Charlie Rich, whom most would dismiss as a phenomenon of country music’s “country-politan”phase of the 1970’s, as a clearly talented and wide ranging artist slowly being destroyed by what all artists seek: popular success. Elvis’s success, flying as it did in the face not only of reason but of good taste as well, seemed in a way final judgment on the world that had scorned him and which by the sheer magnitude of his talent he had transformed. We took it as a cosmic joke…. Most of all we labored happily in the wilderness , self-mocking but earnest, possessors of a secret knowledge shared only by fellow fans: Elvis Presley was to be taken seriously. For Elvis there was no escape in art; his original triumph was his very artlessness. He didn’t write songs, nor did he aspire to anything more than success. Even his films were no more than a magnification of his image, a further reinforcement of the impossible perfection that we demand of all our public figures, and that Elvis alone fulfilled – a perfection that transformed him into an all-purpose, economy-rate icon. In a way, then, Peter Guralnick posits Elvis Presley as an early example of the triumph of image over substance (a triumph that Elvis, had he lived a little longer, might have seen in the Oval Office in the person of Ronald Reagan). The sneer that seemed a hallmark of youth’s rebellion is reduced to a fashion accessory in a Vegas act. In another way, Guralnick’s examples of the price of fame – the imprisonment of Charlie Rich’s artistic freedom by his success and the reduction of Elvis Presley’s cultural impact to, as Guralnick terms it, “the money and the arenas got bigger and bigger,” i.e., cultural rebellion as big business – gets at one of the chief themes of Lost Highway: being an artist is hard; being a successful artist is even harder.